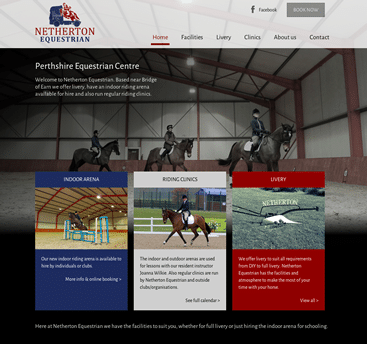 Netherton Equestrian is a new equestrian centre based in Perthshire, featuring a brand new indoor arena where riders can get tuition and practice. We worked with our client to create a number of potential equestrian website designs and then narrowed it down to the final version with a few tweaks to incorporate their preferred colour scheme. Our client already had some good images and we selected one of these to be the “hero” image used on the homepage to set the tone of the site. With a fully responsive design the site works well on desktop PCs and also on mobile phones and tablets.